I'm stretching the Wildlife theme here, but this slippery dip is at my local zoo, which is surely included in wildlife!! I think this is my favourite slippery dip ever and I wish I'd found it as a kid! See where the people are heading...well, there's a bit of a bush track/climb up here to the top of the slippery dip. It's just a worn path in among the rocks and tree roots. It's probably an OHS nightmare, but it's real. Real bush, real climbing, really fun! 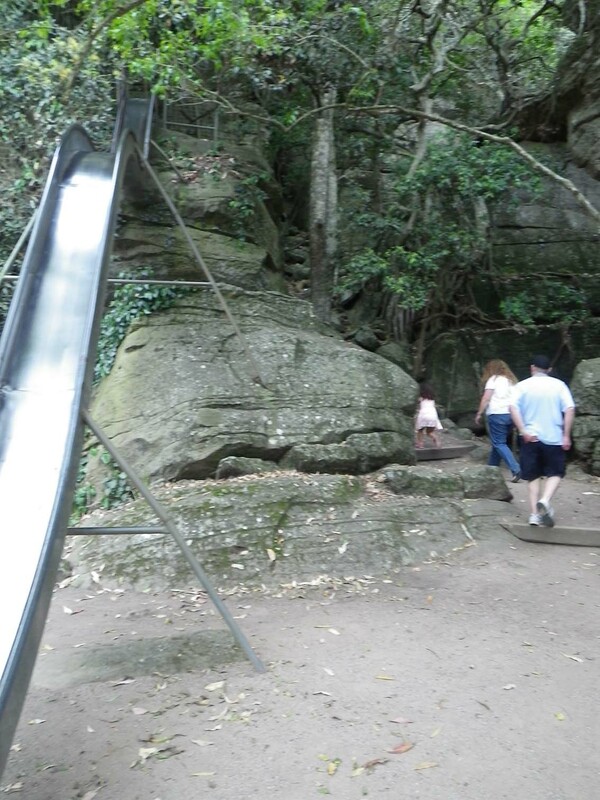 So you climb up this path, then you have two big boulders to climb up before you reach the top of the slide. Kids just seem to race up, but as an adult it's not so easy because your centre of gravity is a bit higher, so climbing rounded rocks isn't as simple as it used to be. But you're there. At the top of the slide. It stretches away, with two dips to slow you down. You can't see the bottom from the top. It's thrilling. Now, try to fit your fat hips onto the skinny slide. Yeah, never thought about that, did you? As a kid, I never even contemplated not fitting...but now...it's a real issue! But I do fit. Phew! How disappointing that when you're wider and heavier, there's that extra bit of friction to slow you down. But man, it's so much fun! I race the kids back up to the top - I lose, but who cares! I'm on the slide again! Do we really have to go home?????? Good on you Cate! We all had a great time, mums, kids, dads at Adventure World earlier this year on the slides and rides.